Dwight Howard believes his dunk rating of 8 in NBA Jam doesn't reflect reality. Neither does jumping from the three point line to eye-level with the shot clock to throw down a 720-degree behind-the-back slam, but who's counting? "They gave me an eight for dunking ... an eight! They did me kind of dirty on that," Howard told ESPN's Jon Robinson. "I won the dunk championship and I get an eight?" Howard's also not a big fan of his 3 speed rating. 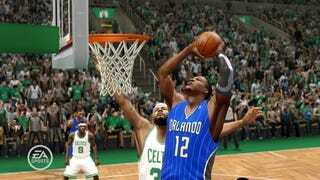 He squawked to EA Sports about the dunk number; the publisher confirmed it'll be boosted to 10 for the next release. "I'll see if they keep their promise," Howard said.